There stands just off Spring Street at Lingards, Slaithwaite, a substantial but unpretentious house, The Elms, of the type which many a well-to-do yeoman built in the eighteenth century. We know, however, that it was actually built by a cleric, a schoolmaster at Slaithwaite. The evidence comes in a most substantial form, an inscribed stone which surmounts the front door, and which late last century was cleaned of the years of grime which its situation above Slaithwaite would undoubtedly have ensured. The carving has suffered little and it now appears very much as it would have done when it was newly wrought. To have true comfort in eternity. The initials standing for John and Ann Murgatroyd. A good deal is known of John Murgatroyd, and indeed the above inscription has not gone unnoticed, being set down by Canon Hulbert in his Annals of the Church in Almondbury. The main reason that our knowledge of John Murgatroyd is anything other than passing is the survival of some of his diaries and other writings. They were utilised by Canon Hulbert and H J Morehouse in the nineteenth century when they wrote The History of Slaithwaite Schools, and some are now readily accessible again having been deposited with West Yorkshire Archives, Kirklees, by the Colne Valley Museum. The existing diaries, and certain years are missing, are detailed and informative on many topics. The purpose of the present article is to consider the documentation relating to the construction of John Murgatroyds house contained in his diary for 1786. 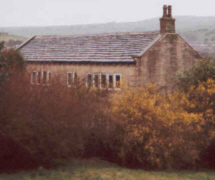 On 19 January Murgatroyd agreed to quit Slaithwaite school and four days later resigned it into the hands of the Trustees, noting "I have been master from May 29th 1738 near 48 years." The diaries are missing for the previous three years, but no doubt his impending retirement had focused his mind on the need for accomodation when the time came to remove from the schoolhouse. He decided to have a new house built and settled on a site at Lingards, close to his wifes family, to which district he removed whilst the building was going forward. No doubt his diary for the preceding year would have chronicled negotiations with the Dartmouth estate, whose land it was. An entry at 8 March "Mr Mellor brought the three trees at Lingards he said he would fell em today" may relate to clearnce of the site, for the matter was then in hand, and five days later he recorded that "the mason had been at Lingards ordering about our new house. Joseph Pogson and two others were felling the trees this afternoon." The operation must have gone well for nothing untoward is mentioned. Such was not always the case. In the diary of Arthur Jessop is an entry "21 March 1745/6 Eli Wilkinson, a carpenter who was stubbing [grubbing up by the roots] a yew near the steps between Lockwood and Huddersfield, and a boy that was with him, were both killed with the fall of it on Tuesday 18." On 18 March Murgatroyd notes that he was at the stone pit the first time. He would not be labouring, or even directing the work, for the overseeing of the matter was the responsibility of the mason, an experienced builder as opposed to a stone hewer. The planning of the house would have been a matter of discussion between Murgatroyd and his mason, and any afterthoughts or revisions would be taken up with the latter whose responsibility it would be to direct the various labourers. Murgatroyds purpose in visiting the stone pit was almost cartainly to check whether labourers were working and how many, with a view to being able to audit their bills when submitted. Joseph Pogson was the stone-getter in the local stone pit which was being used, and one of the first notes which bears on him "21st March Joseph Pogson went a drinking today some will not learn wit", did not bode well though subsequently Murgatroyd appears to have been satisfied with him. A sandstone quarry is shown at Kitchen Clough, not a quarter of a mile from the site, on the Ordnance Survey map of 1848 and may well have been the pit in question. Close by is Hollins Row, and Murgatroyd noted at 1 May "Cuddy [a local carrier] leading foundation stones out of the Hollins with 3 horses and a man." The quarry was almost certainly owned by the Earl of Dartmouth, and difficulties in relation to it are soon noted. "25th March James Varley the Clerk yesterday gave Joseph Pogson a discharge from going forward at stone pit and this morning did the same. Edmund Mellor sent for him and Mrs talked him roundly over this morning." At 27 March "Joseph Pogson went this morning to Mr Baildon with a letter about stone pit and he had another letter for Edward Elmsall Esq which he intended to have carried to him, but Mr Baildon being to meet him and Capt. Elmsall at 11 oclock, he took the letter and saved Joseph the journey. He sent a smart letter to the Clerk, who had said that I should not have a stone; but Mr Baildon told Joseph to let me first have what stone I should want, to let John Varley get for his mill, then admit nobody else but get and sell himself to whoever should want God prosper Joseph." The Elmsall family of Thornhill were agents for various estates in the area, collecting rents and conducting the manorial Courts of their principals. Edward Elmsall and Baildon were stewards to Sir George Savile, and Baildon was probably also a local agent. John Varley lived at Lingards Fold close by Murgatroyds plot, and is recorded elsewhere as building Shaw Carr Wood mill in 1787. The Varley family were also operating Lingards corn mill in the following century. On 24 March the mason staked out the ground and the following day the digging of the cellars began, an undertaking which was not completed until 3 May! On 11 April Murgatroyd recorded "Mr Mellors men vizt. Messrs Shaw, Wood, Clay and Garside were taking off the soil, laying it on a heap and digging a foundation for our house. Joseph Pogson was working in the stone pit. Mason came again this morning and gave the necessary directions about digging a foundation for our house and for a cellar under the parlour southward about 5 yards long and 3 broad. I went with him to the stone pit where he said there will be wall stone and paving but no cutting stuff and no corners." A better quality stone was required for the corners, which are a feature of so many of the vernacular buildings of the 17th and 18th centuries, and cutting stuff is probably the freestone from which ashlar could be sawn, Corner stones were available within two or three miles; at 1 May Murgatroyd entered "Meltham masons getting corners in John Taylor's stone pit. "8 It appears that blocks of stone large enough for the purpose were first hewn and then removed to Lingards to be dressed, for the following day he notes "one mason come and hewing corners i'th lower warehouse." The masons were working throughout May, hampered only by heavy rain, which was probably the reason that some of the stone working was going forward inside a warehouse. On the 23rd he noted that the masons had begun the footing and at the 29th "6 masons and helpers are come this morning to begin in earnest for a new house. Cuddy leading the foundation stones from Hollins with 3 horses, John helping him and with white Galloway leading stone from stone pit for cellar windows etc. Joseph Pogson & his man in stone pit. Jack oth Kitchen helping masons." With over 10 men involved it is perhaps not surprising that the following day the diary reads "about the masons etc respecting our intended house in another book." The whereabouts of this other book is not known, but from then on the amount of information on the works is minimal, often just a note "looking at workfolk." By 10 July he was able to note "The masons began this morning to wall on the base stones. So we begin for our new house. The Lord give a blessing to our undertaking." A month later he rode to Sowood "about a stone for an inscription", and was there on the same errand on the 25th August. This is the inscribed stone which still graces the property. The stone is a large one and would have had to come from quarries which could supply good quality stone in large blocks. 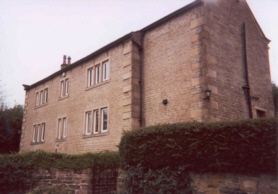 The beds in the area of Sowood provided such stones and there is little doubt that they were used in some of the major buildings in Huddersfield at a later date. It is probable that stones for the columns of the Infirmary and the Railway Station originated there, and it is known that the quarries provided stone for the east front of the George Hotel. The house was to be slated; on 1 April Murgatroyd records "The mason came over again, went to stone pit and we a little altered the plan of the building one Marmaduke came with him about selling me some blue slates," Later in the year when he was at Sowood about the inscription stone he met Marmaduke and settled with him. Starting at the end of April much earth was led into, and spread on, 'the lane', and it seems that not content with an approach from the Lingards Fold side Murgatroyd had brought in a lane from the area of the present School Terrace. By 19 September the building was well forward and Murgatroyd recorded "We had this day the rearing for our new house, The Lord give us grace to live in it the little time that we have left in this world, so piously as to die happily." The next mention is at 2 December "We had Richard Horsfall measuring our new house, there was T Gledhill, J Edwards and Isaac Platts - J Pogson, J Wood carpenter - things were not concluded before 11 at night - but amicably at last - though there had been some telling of one anothers faults." The building had clearly been let at a rate per yard, rather than a total cost, a practice which was still followed in the 1850s, hence the need for an independent party to measure the completed work. Once this was out of the way the interior had to be finished off and on 16 December the joinery and plastering was let, the former to Edmund Kershaw. In the absence of Murgatroyd's 'building' book we have to look elsewhere for an indication of the cost of the building. In 1774 John Beaumont, a clothier, erected a house at Dalton near Huddersfield, which was probably of a similar size and quality, his total costs were £200-18-7. The diary for 1787 is also missing, so we are unable to share the undoubted pleasure which John would have had when he was able to remove himself and his 'small family', his wife Ann and Phoebe their servant, into their new home, It would surely then have made worthwhile the hardship which is expressed in his closing entry for 1786, "It has been a troublesome year to me in building a habitation for us the little time we have to be in this world." In fact Ann Murgatroyd was to live another ten years and John, who was 67 when he built the house, lived a further twenty years, after which the house passed to Hannah Mellor, his wife's niece.